Both sides brought some excellent domestic form into the occasion, with the Gunners enjoying a five-match winning streak, while Spurs have only lost once all season long.Kieran Gibbs emerged as a super sub and Arsenal's unlikely hero in Sunday's north London derby as his first goal in over a year ensured a 1-1 draw against Tottenham at the Emirates Stadium. Spurs are back up to fifth in the table, five points adrift of both Arsenal and City and three behind fourth-placed Manchester United.Both sides had their chances to score more than the goal apiece that they managed, but you get the sense that Arsenal will be the happier side with the point based on how this match went. The Gunners are still second, level on points with City once again, while Tottenham move one up into fifth. 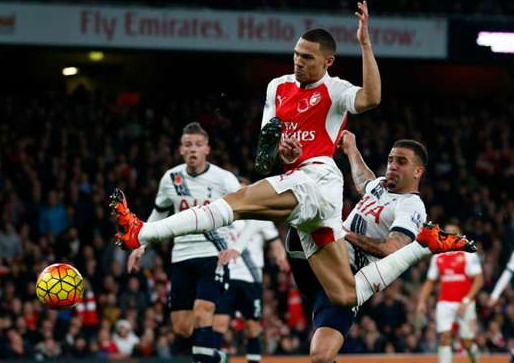 Full Time Score : Arsenal 1-1 Tottenham.